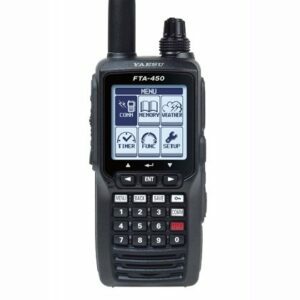 The Yaesu FTA-450L is the Comm Only Airband Transceiver, of the Yaesu FTA 550. The YAESU FTA-450L is a competitively priced (COMM ONLY) version of the wildly successful FTA-550L and FTA-750L. Featuring the same Easy To Operate icon driven menu system, on a large 1.7″ x 1.7″ Full Dot Matrix Display. The same Loud 800mW internal audio speaker guarantees calls will not be missed. 8.33 kHz Narrow Band compatible, with a programmable 200 channel memory bank, means all favourite channels can be easily stored and retrieved with just a few button presses. Valued packaged with all the necessary accessories, including 110VAC and 12VDC chargers, headset adapter, Alkaline battery tray, Belt Clip, USB programming cable, and a large capacity 1800mAh Li-Ion rechargeable battery. The YAESU FTA-450L is a competitively priced (COMM ONLY) version of the wildly successful FTA-550L and FTA-750L. Featuring the same Easy To Operate icon driven menu system, on a large 1.7" x 1.7" Full Dot Matrix Display. The same Loud 800mW internal audio speaker guarantees calls will not be missed. 8.33 kHz Narrow Band compatible, with a programmable 200 channel memory bank, means all favourite channels can be easily stored and retrieved with just a few button presses. Valued packaged with all the necessary accessories, including 110VAC and 12VDC chargers, headset adapter, Alkaline battery tray, Belt Clip, USB programming cable, and a large capacity 1800mAh Li-Ion rechargeable battery. 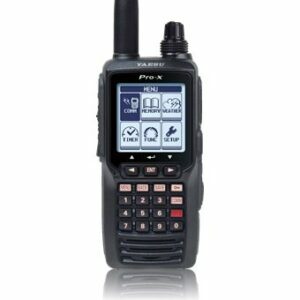 The YAESU FTA-750L Combining tradition with innovation. With a history of high quality communications the FTA-750L now includes a 66 channel GPS receiver for reliable navigation. Boasting an oversize full dot matrix LCD display, the FTA-750L Airband Transceiver / GPS provides full communication on the Aircraft communications Band and additionally provides VOR and ILS navigation features on the "NAV" band, and waypoint navigation with the built in GPS receiver. The FTA-750L includes NOAA weather band monitoring, the capability of programming up to 200 memory channels with a quick and easy channel recall feature. The brand new easy to operate menu system is icon driven making it simple to navigate through all of the powerful features this transceiver / GPS has to offer. In addition the FTA-750L can easily be reprogrammed in minutes using the optional PC Programming software and the supplied USB programming cable. The YAESU FTA-550L is packed with features, while being very affordable. 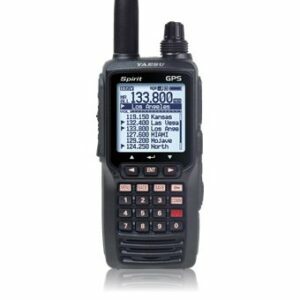 Boasting an oversize full dot matrix LCD display, the FTA-550 Airband Transceiver provides full communication on the Aircraft communications Band and additionally provides VOR and LOCALISER navigation features on the "NAV" band. The FTA-550 includes NOAA weather band monitoring, with the capability of programming up to 200 memory channels using a quick and easy channel recall feature. The brand new easy to operate menu system is icon driven making it simple to navigate through all of the powerful features this transceiver has to offer. In addition, the FTA-550 can easily be reprogrammed in minutes using the optional PC Programming software and the supplied USB programming cable.